“Have stole the very river from us!” ] On the occasion of his first levee, some member of the huge crowd that blocked the street inquired what was the matter, and George Brudenel, a well-known wag, at once answered, “Matter enough! There’s a Scotchman got into the Treasury and they can’t get him out!” [A Century of Anecdote, by J. Timbs.] But if Lord Bute was a never-ending delight to the satirist and a bugbear to the public, in the circle of his own home he seems to have inspired respect and affection, though periodic bouts of ill-temper made him at times inaccessible even to his own children. Lady Louisa’s mother was the daughter of Lady Mary Wortley Montagu, whose letters are as well known as her famous quarrel with Pope, and for whose epistolary style a modern critic has claimed a higher order of literary excellence than that attained by either Lord Chesterfield of Horace Walpole. [Men and Letters, By Herbert Paul, p.184.] From her grandmother Lady Louisa undoubtedly inherited the gift of expressing herself on paper with a vivacity and humour which made her correspondence most welcome to her contemporaries, and still enable it to retain a perennial interest for the readers of to-day. In some introductory remarks which Lady Louisa wrote in 1837 for an edition of Lady Mary Wortley Montagu’s works, she says of her grandmother’s style that, “though correct and perspicuous, it was unstudied, natural, flowing, spirited; she never used an unnecessary word, nor a phrase savouring of affectation; but still she meant to write well, and was conscious of having succeeded.” [Introductory Anecdotes to the Works and Letters of Lady Mary Wortley Montagu.] Much the same criticism might be written on the subject of Lady Louisa’s letters. But she was clearly not conscious of the success she achieved, and the masculine note, which sounds so clear throughout the grandmother’s correspondence, is replaced by a far tenderer tone in that of the granddaughter. In her nursery days she devoted much of her leisure to attempts at jotting down her thoughts and opinions. Lady Mary Coke, the youngest daughter of John, Duke of Argyle, in her Memoirs, recalls her first meeting with Lady Louisa, “a very extraordinary Girl, who has certainly a great genius,” when the latter was only ten years old. “I stayed with Lady Bute until two o’clock,” wrote Lady Mary in 1767, “and was much impressed with her youngest daughter, who showed us the beginning of a French novel written by herself, and informed us She was going to write a play, that the plan was fixt, and was to be taken from a Roman Story.” [The Letters and Journals of Lady Mary Coke, edited by the Hon. J.A. Home, vol. i. p.174. (David Douglas: Edinburgh, 1889.) “Jugurtha” was the hero of this play, which does not appear to have been completed. Lord Bute retired from public life in 1763, when Lady Louisa was five years old, and devoted himself to horticulture and other rural pursuits, perhaps more suited to his talents – certainly more agreeable to his tastes. Science and botany were his particular hobbies, and he published at his own expense an illustrated work in nine volumes on the subject of British plants, only twelve copies of which were printed, at a cost which is said to have reached £10,000. There is, as lady Louisa suggests, nothing in the world so depressing as a social gathering of which the elements are inharmonious or unsympathetic. Nor is anything so fatal as an attempt to give an entertainment of what is called a “mixed” description. The lions of the day are furious at being asked to meet one another. They sit and glare at the floor in sullen silence. Like the animals in Bombastes Furioso, “the last lion thinks the first a bore,” and not all the blandishments of a seductive hostess can induce them to roar in unison. The artistic world has no wish to meet the society world; the society world finds nothing to say to the artistic world. The effect of combining the two results in a gloomy form of conversazione from which everybody hastens away with a sigh of relief. Lady Louisa was an earnest and kindly student of human nature. She cherished a profound devotion for the world at large. 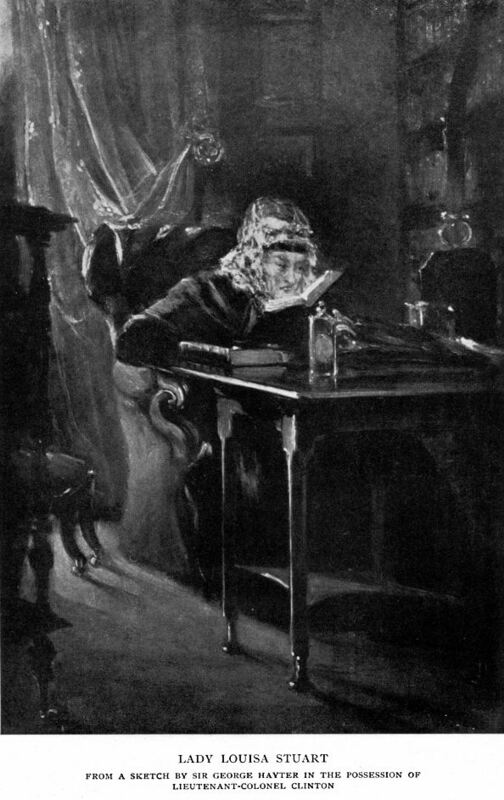 She might truly have said of herself, as did Abou Ben Adhem, “Write me as one who loves his fellow-men.” Consequently she was never bored; she could obtain pleasure from the most incongruous society; her soul was filled with a universal tolerance which ensured for her a well-deserved popularity and a warm welcome wherever she went. Lady Louisa’s first love affair proved also to be her last, but, although she does not seem to have contemplated matrimony very seriously in later years, it was not the lack of admirers that impelled her to remain single. She was never, it is said, a beautiful woman, but possessed to an unusual extent that elusive quality called “charm,” which as a rule proves fully as attractive as the more easily defined gift of physical beauty. Fanny Burney has drawn a miniature pen-portrait of her which helps to explain her popularity. “Lady Louisa Stuart,” she says (writing in 1786), “has parts equal to those of her mother, with a deportment and appearance infinitely more pleasing: yet she is far from handsome, but proves how well beauty may be occasionally missed when understanding and vivacity unite to fill up her place.” [The Diary and Letters of Madame D’Arblay, edited by Charlotte Barrett, vol. iii. p.237. (1842).] It is not therefore difficult to understand that several of the foremost men of her time should have laid siege to the heart of so charming a woman, though it may be less easy to appreciate Lady Louisa’s decision to remain a life-long spinster. Like many other women of wit, she was hard to please, and might have explained her reasons for remaining unmarried in the words of Becky Monteith, a celebrated beauty, who, on being asked why she had remained single so long, replied: “Ye see, I wadna hae the walkers, and the riders gaed by!” A woman’s taste becomes more fastidious as she grows older, and by the time she has reached an age at which, in the opinion of her friends, she should be content with any marriage, before it be too late to marry at all, she has grown so particular as to the necessary qualifications of a suitable husband that her requirements are hardly likely to be satisfied. This seems an unfortunate provision of Nature, usually so tactful in controlling the laws of supply and demand, and is the reason why many of the most delightful women remain single until all their admirers have grown tired of waiting and are married to less fastidious wives. There was yet a third man of fashion with whom the name of Lady Louisa was for a time connected. On the death of Anne, Lady Strafford (daughter of John, Duke of Argyll), the gossips of society at once arranged a match between Lady Louisa Stuart and the newly-bereaved widower. The approaching marriage of this ill-assorted pair was announced in every paper, and provided the busybodies with as fertile a topic of conversation as do the annual engagements of peers and actresses, which help to stimulate the small talk of a modern dinner-table. One-half of London society smiled knowingly at the other, and declared that it had long suspected something of the sort. The other half retorted by exclaiming, “What did I tell you?” and wisely shook its head. Both were equally delighted at having found a fresh source of gossip. Such a match was not very generally approved, however. “So Lady Louisa Stuart is going to marry her great-grandfather, is she?” said Lady Di Beauclerk to a friend. “If she can hold her nose and swallow the dose at once, it may do well. But most people would be apt to take a little sweetness in their mouths afterwards.” [Memoirs of the Argylls. (Included in the Journal of Lady Mary Coke,) vol. i. p.xlix.] Lady Louisa was, indeed, quite unwilling to swallow the dose, which was equally averse to being swallowed. She had always looked upon Lord Strafford in the light of a kind but elderly uncle, rather than a possible suitor. He, too, was thoroughly opposed to the alliance, and the whole affair ended as speedily as it had begun, without occasioning anything more serious than a certain measure of natural annoyance on the part of the two principals. After the usual nine days of wonder, the matter was allowed to recede into the nebulous background whence it had originally sprung, and fashionable society turned its attention to some more amusing, but doubtless equally unreliable, scrap of misinformation. At her mother’s decease Lady Louisa settled in a house in London, No. 108 Gloucester Place. Here she resided until the day of her death, the centre of a circle of intimate and devoted friends. During her father’s lifetime she had made the acquaintance of many interesting personages in the world of art and letters. Of these, their talents or peculiarities, she was never tired of speaking. One of the most curious was John Hoole, the poet and translator of Tasso and Ariosto, “and in that capacity,” as Sir Walter Scott remarked, “a noble transmuter of gold into lead.” [The Journal of Sir Walter Scott, vol. i. p.204.] Him she had met in early life when, as a clerk in the India House, with a snuff-coloured suit of clothes and long ruffles, he paid occasional visits to Lord Bute. Hoole made it a custom to complete so many couplets every day, habit making it light to him, “however heavy it might seem to the reader,” [Lockhart’s Life of Scott, p.341.] and his quaint appearance was one of Lady Louisa’s earliest recollections. Her acquaintance with Walter Scott, of which the seeds were sown at Dalkeith Palace, the seat of the Duke of Buccleuch, ripened into friendship at Bothwell Castle, where in 1799 the novelist was staying with Lord Douglas and his wife, formerly Lady Frances Scott, with whom he had long been on terms of the warmest affection. Ten years later we hear of the poet reading his Stag Chase to Lady Louisa when they were staying together with the Duke of Montrose at Buchanan House. As the years went by, this friendship between Scott and Lady Louisa deepened and strengthened, and these kindred spirits forged a bond of mutual sympathy and common tastes that linked them together in an intimacy which was to prove a source of lifelong satisfaction to both. The two friends corresponded frequently and freely. “I would hardly write this sort of egotistical trash to any one but yourself,” says Sir Walter in 1817. His correspondence with his other acquaintances contained many references to Lady Louisa. She “unites what are rarely found together,” he writes in a letter to Mrs. Hugh Scott of Harden, “a perfect tact, such as few even in the higher classes attain, with an uncommon portion of that rare quality which is called genius.” [Gleanings from an Old Portfolio, vol. iii. p.195.] She possessed, as he declared, the art of communicating criticism without giving pain, an art by no means easy to acquire, and as rare to-day as it was a century ago. No doubt Sir Walter often acted upon her advice, knowing it to be that of a friend whose judgement could be relied on as impartial and unprejudiced, who was not to be ranked among those “good critics,” who, as Robert Browning says, “stamp out a poet’s hope.” Scott was certainly most appreciative of Lady Louisa’s approval of his own works. On the back of one of her letters to him, in which she praised his poem, the field of Waterloo, he wrote, “This applause is worth having!” But Lady Louisa’s criticism was too genuine to partake of the nature of flattery. She did not agree with Goldsmith that “who peppers highest is sure to please,” and gave Sir Walter credit for too much taste and discernment to relish what she called “all sugar and treacle.” This is clear from a number of her letters to the novelist, in which she lays her finger tactfully but none the less forcibly upon the weak spots of his literary fabric. Writing on the subject of Rob Roy in 1818, “The beginning and end,” she says, “I am afraid I quarrel with; the mercantile part is heavy, but some part always must be so to give what painters call relief, and beginnings signify little. Ends signify more. Now, I fear the end of this is huddled, as if the author were tired, and wanted to get rid of his personages as fast as he could, knocking them on the head without mercy.” [Familiar Letters of Walter Scott, vol. ii. p.11] All of this Sir Walter took in good part, and was duly grateful. And woman, as she should be, - soft. The fabulous tradition round which these verses were written was that of an ancestor of Sir Walter, a certain Sir William Scott of Harden, who, after plundering the estate of Sir Gideon Murray of Elibank, was captured and brought in chains to the castle of his victorious enemy. Sir Gideon resolved to hang the young Knight of Harden (as Sir William was called), but at the thoughtful and typically maternal suggestion of his wife, gave the prisoner a choice between death and marriage with Meg, the ugliest of Lady Murray’s three unmarried and singularly unprepossessing daughter. “Hang Harden’s Chief! A precious jest! A batch’lor, youthful, comely, rich! Ill-favoured as a nightmare each. I sleep not till the thing be done. Meg was so exceptionally unalluring, however, that the young knight positively declined the honour of her hand. For a prudent, a virtuous and honourable wife. Most of Lady Louisa’s literary work is unfortunately hidden away in volumes privately compiled for the eyes of relatives or descendants. Mention has already been made of her “Introductory Anecdotes” to Lord Wharncliffe’s edition of the Letters and Works of Lady Mary Montagu, which she illumined with the same facile and delightful style already displayed in the Memoir entitled “Some account of John, Duke of Argyll, and his family,” which she had written ten years earlier. How brilliantly and charmingly she could write may be gathered from her correspondence, much of which has fortunately been preserved for posterity. In this age of sixpenny telegrams and halfpenny cards, letter-writing is practically a lost art. We no longer sit down and compose lengthy essays upon topical subjects for the edification of absent friends. We are content to scrawl a few hasty words on a half-sheet of notepaper instead. In return we receive a picture-postcard adorned with a view of some foreign cathedral in which we do not take the slightest interest, and inscribed with a few slipshod and meaningless sentences scrawled in evident haste in an almost illegible handwriting. But if we have little time or inclination to emulate the more laborious methods of our ancestors, we can still appreciate the skill, the wit, and observation which combined to make the labours of such perfect correspondents as Byron, Edward Fitzgerald, or Madame de Sévigné a source of endless delight to successive generations. Private letters are a sure gauge to character, and from those of Lady Louisa we can form a fairly just opinion of the personality of this charming woman. She was, I cannot help thinking, one of those women whom nature has designed to be an aunt. Not, be it said at once, that narrow, bigoted type of maiden aunt, dear to the heart of the humorist and no one else, who lives in a suburban villa surrounded by a menagerie of exceptionally overfed and underbred pets; but the kindly tolerant aunt whom schoolboys adore, who does not confine her generosity to the giving of good advice, not take every occasion of remarking that “it was not so in her young days.” Celibacy did not have the effect of narrowing Lady Louisa’s horizon, for no one ever had a broader outlook upon life than she. Her sisters sought her counsel in times of trouble; her friends ever found comfort in her ready sympathy. In he nephews and nieces, and grand-nephews and grand-nieces, she took the deepest interest; it was for their edification, indeed, that she undertook that history of the Argylls, which she regarded as a true labour of love. She was universally adored by the younger generation. Her youthful relatives could always be sure of her interest and appreciation, and she was ever a patient listener. Mothers must occasionally disapprove; but aunts do not labour under the same burden of responsibility. They can be sympathetic when perhaps they should be severe. Into her kindly ear the “heirs of all the ages” poured the tale of their ambitions, their loves, their troubles, and she helped them or comforted them, and sent them away happier for her advice. Her own life was not altogether a happy one. “She has, God knows, been tried with affliction,” said Sir Walter Scott, “and is well acquainted with the sources from which comfort can be drawn.” Her only serious love affair brought her nothing but misery and disappointment. “Fye upon Cupid,” she once wrote, “the nasty little devil has used me always ill.” [Gleanings from an Old Portfolio, vol. ii. p.27.] She would not have been human and a woman had she never suffered from that instinctive consciousness of failure which assails the heart of every woman who resigns herself to perpetual spinsterhood. She lived to an extreme age which cannot be reached without suffering the loss of many dear friends. Her sisters, to whom she was devoted – Lady Jane Macartney, and Caroline, Lady Pontarlington, to whom she addressed most of her correspondence, being her especial favourites – predeceased her. Her greatest friend, Lady Ailesbury, [Lady Anne Rawdon, daughter of the 1st Earl of Moira.] who humorously styled herself “Crazy Jane,” and of whom Lady Louisa wrote that “without positive beauty, she had the charm of countenance, grace, figure, and altogether something more captivating than beauty itself,” died in 1813, after being one of the chief objects of her life for many years. She survived Walter Scott by a quarter of a century.